Happy Thanksgiving to all our loyal readers out there, I hope this holiday season brings you much joy. Remember the 3 F's, Faith, Family, and Football! 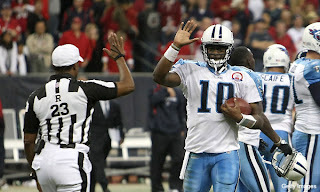 1) Isn't it great to see Vince Young back starting at quarterback for the Titans and playing at such a high level in the NFL?! There was a play on Monday night that caused me to have a flash back of the the 2006 Rose bowl game. Brian Cushing (USC), now with the Houston Texans was chasing Vince Young (Texas) down the sideline on a scramble, and it was like 'Hey, I've seen that before!" 2) Tim Tebow plays his last game at Ben Hill Griffin Stadium, or “The Swamp" Saturday at 3:30pm vs Florida State. Urban Meyer has shown a lot of emotions this week in press conferences when Tebow's name has been mentioned. 3) Nevada takes on Boise State Friday night for the WAC championship (10:00pm on ESPN2), immediately following the 'Backyard Brawl' with Pittsburgh traveling to West Virginia (7:00pm on ESPN2). Nevada (8-3, 7-0 WAC) is the first team in NCAA history to have three 1,000-yard rushers in one season. The Wolf Pack lead the nation with an average of 373 yards rushing per game. No one else is within 60 yards of them. Nevada is known as the inventor of the 'pistol formation', a spread offense extension that has really become popular though all levels of football. Have a great rivalry weekend folks!